Bonus Karting Giveaway at Slideways on St Patrick’s Day! 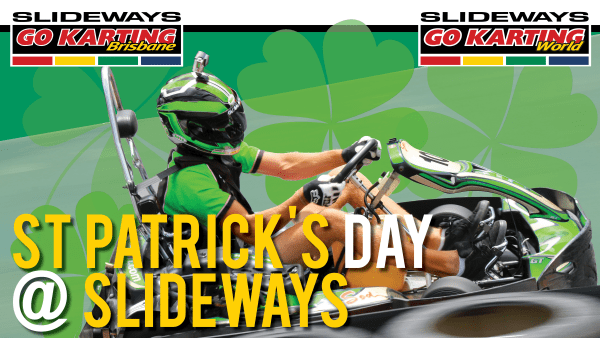 Home News and Updates Bonus Karting Giveaway at Slideways on St Patrick’s Day! At Slideways Go Karting Brisbane Eagle Farm and Slideways Go Karting World Pimpama on St Patrick’s Day (Friday March 17), we’re giving away bonus karting! Simply purchase a VIP Gold Pass (four sessions for $25 each, our best value karting), and we will throw in a bonus 10-minute session for free – five sessions for $100, simply unbeatable! The beauty of a VIP Gold Pass is that you can use the credits at any of our three Slideways venues at any time on any day, and they never expire. This offer is available at the above-mentioned venues only by simply mentioning this promotion when you sign in at the counter. So, crack out your finest green threads, and we’ll see you trackside for some Slideways good times! We’re going racing in a big way in 2017! The second round of the Slideways Enduro Series currently is offering discounted early bird entry fees for the race on March 12. The opening event was a cracker – read up on the full details here. For the first time ever, Slideways Go Karting World is hosting a Junior Racing Series for Cadets and Juniors, aged between 7 and 15. All of the details are on their dedicated web page. Slideways is also kicking off our first ever Sprint Series for adult racers. Both the Juniors and the Sprint Series kick off on April 23. Junior Karting Academy Is GO! The Slideways Junior Race Series is complimented by the Slideways Junior Karting Academy, with mid-week tuition for racers of all ages and skills. Basically, you just pay for the track time, with the highly experienced Slideways staff on hand to give you the tips and tricks to improve your racing. Great fun, and the ideal after school activity – check out our website for all the details.